Bart Massey, Executive Director of the USA Drone Port is a Licensed Remote Pilot with the FAA and is the Executive Director of the USA Drone Port. The nation’s first non-profit drone facility used to train, invent, innovate, develop and manufacture unmanned robotics. The USA Drone Port is the catalyst for entrepreneurs, educators, students and innovators grow. In the fall of 2017, he led the first team to have a live UAS integration into Search and Rescue in the state of Kentucky. This event included three helicopters, seven UAS Pilots, five fire and rescue departments, land-based rescue vehicles and many spectators and facilitators. Bart has most recently visited with United States Pentagon regarding the future of unmanned systems. Chris Stiles is CEO of Unmanned Services Inc., and currently serves over 200 customers to include government and academic institutions, and has 5 licensed pilots that have conducted 2,288 flights totaling 952 hours under Part 107 Rules. USI was also one of the first entities granted a night flight waiver. Chris has experience on over two dozen UAS systems operating a variety of specialized payloads and sensors, and has conducted 8,000+ hours operating in BVLOS and EVLOS conditions while conducted flight operations from military airfields and at international commercial airports. 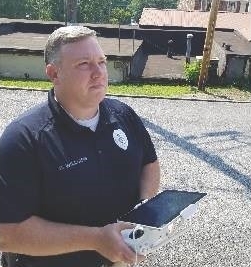 Darian Williams is a Captain with the Hazard Police Department and serves as the Chief Pilot for their UAS Program. HPD has utilized UAS technology for Collision Reconstruction, Search and Rescue, Intelligence Gathering, and Situational Awareness during high-risk warrant service. Darian previously served as the Aviation Technology Project Manager for a U.S. Department of Justice program that provided technology assistance to state and local public safety agencies. In that role, he worked closely with FAA representatives to assist public safety agencies with integrating manned and unmanned aircraft into their operations. Darian is also a Certificated Private Pilot and serves as the Pilot in Command during the USA Drone Port Search and Rescue event trainings. Paul Campbell is an officer and a UAV Pilot for the Hazard City Police Department. Campbell, along with Williams, has conducted aerial photography utilizing a UAS for accident reconstruction as well as search and rescue operations during reports of high-risk missing persons.